The Div. III Indoor Track & Field NCAA Championships took place over the weekend, with two Jumbos qualifying and showing out at the Reggie Lewis Center in Boston. Junior mid-distance runner Rhemi Toth competed in the mile, placing seventh in the finals to earn All-American honors. Senior distance runner and co-captain Kelsey Tierney in the 3k and finished 10th place in her event. To get to the final race for their respective events, the runners first had to pass the preliminaries on Friday. Toth placed ninth in the mile preliminaries with a time of 5:03.48. This time was a mere 1.83 seconds ahead of runners outside of the top ten, which was the cutoff for the one-mile final on Saturday. Toth posted a time of 4:55.13 in the final, a career best and good for seventh place. Just 0.39 seconds separated her from the eighth-place finisher, but she was a comfortable eight seconds ahead of ninth, where the All-American window closes. The junior knew she was running a good race in the final, but she noted that was not so focused on the clock during the action. Toth remarked that she was always looking ahead, trying to figure out if she could stay in All-American contention. And keep the position she did, as she was able to earn the first All-American honor of her career. Toth took part in the distance medley relay in year’s indoor championships, so this was her first time running individually on the national stage. Needless to say, she made the most of the opportunity. As for Toth’s captain and teammate, Tierney qualified for the NCAA championships with a time of 9:47:48. This was, and remains, a personal record for Tierney in the 3k race. That time got her to the prelims, in which she came in sixth place, posting a time of 9:58.64. This time was well within the top-12 time needed to advance to the final race. In Saturday’s 3,000-meter final, Tierney placed 10th out of 12 runners with a time of 10:08.26. Tierney had stiff competition in the finals, as she was 11.5 seconds behind the ninth-place finisher and 13 seconds from earning All-American honors at the eighth spot. Tufts garnered two points from Toth’s mile finish. The two points placed the Jumbos in a tie for 64th place. 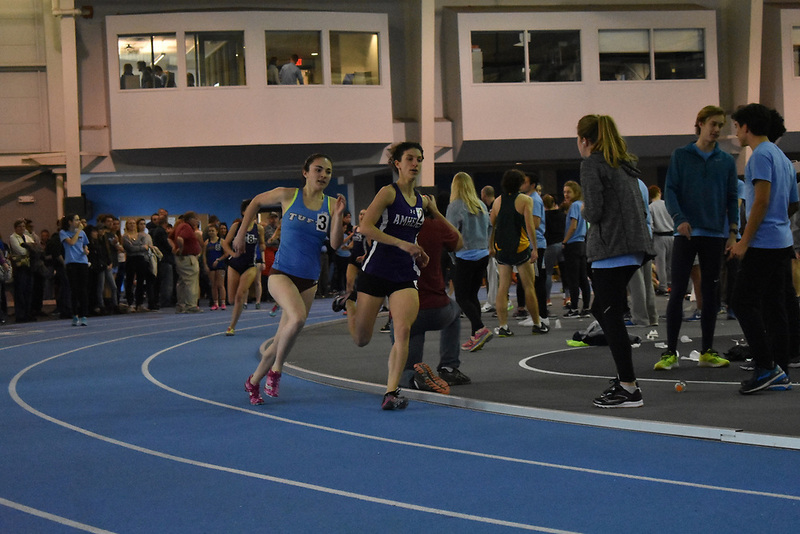 NESCAC rival Williams took home first place in the meet with a whopping 42 team points, which was unattainable for teams like Tufts, who only had two runners qualify. The meet took place in the Reggie Lewis Center, right in the Jumbos’ backyard. This created a sort of home-field atmosphere for Tufts’ runners. This obviously helped Toth’s efforts, as evidenced by the All-American finish and career-best time. The meet was also just a short T ride away from campus, so many of Toth’s and Tierney’s friends, family and teammates were able to make the trip to cheer on the Jumbo runners. Next up for the Jumbos is the start to the outdoor season. They’ll kick off their spring season by hosting the Snowflake Classic on March 30 at home at the Ellis Oval track.